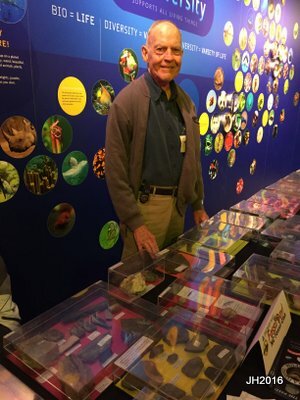 The Discovery Place in Charlotte, NC held their Fossil Day on November 12, 2016. The NC Fossil Club was represented by Ruffin Tucker and Joy Harrington. 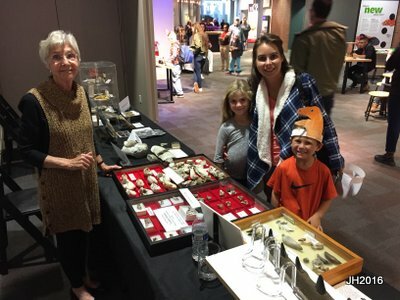 Discovery Place had some interesting ideas for hands on projects getting the young and their parents involved in fossils. There was a table where fingerprint dinosaur prints of many colors could be made. Another table had small plastic dinosaurs sealed in plaster stones to be broken open by the kids and parents to begin their collection. There were over 1900 persons attending the event.